Happy New Year, Tonic-ettes! Finally, we have internet access again and I am reunited with you all via the blogosphere once more. We are settling in to our new home by the beach very nicely indeed - it's been a crazy but beautiful few weeks! (above) This was the view that greeted Mr Tonic and I from our bed on the floor (our bed didn't fit around the corner!?) 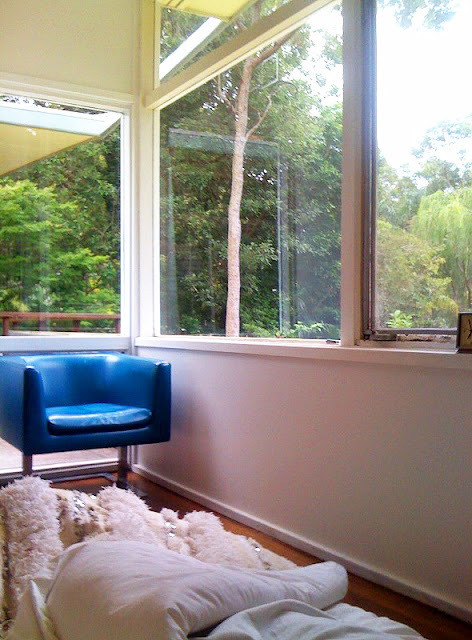 on our very first morning in the new house - tall trees as far as the eye can see. We simply had to reach for the iPhone and capture it. PS I have so much more to share - Mr Tonic is undercoating the living room as we speak, I write this from my brand new office (on a brand new chair! ), the cicadas are loudly chirping and the sun is shining brighter than ever. It's good to be back. Happy New Year! Happy New Year to you Louise, it looks like 2011 will be filled with lots of wonderful 'newness' and the satisfaction of creating a warm and stylish home. Happy New Year Louise. Great beginnings. Wishing you and your family a wonderful, adventerous and healthy new year! sounds glorious, how exciting - i'd swap you for the dingy old UK any day! happy new year! what a fabulous house to start the new year in!! cheers to 2011! Welcome back to the interwebs, Louise! Happy New Year! Oooohh! Can't wait to see everything. Just found you and are your newest follower...going to head back and read your old posts!! Oh it sounds heavenly...what a fabulous way to start the new year!! Hi Louise, I'm new to your blog and love the before and after's of your house. I will have to post some of my own as we currently undergo a bit of a house renovation/extension which I like to call extenovation! And I'm 6 months pregnant. Nothing like a deadline! I think i just died and went to chair heaven! Where did you find that amazing blue beauty? what kind is it?